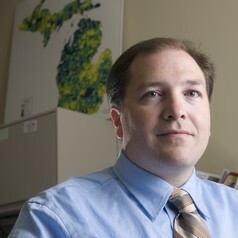 Dr. Eric Scorsone is the director of the MSU Extension Center for Local Government, Finance and Policy. Dr. Scorsone is an MSU Extension specialist, and a professor of economics in the Department of Agricultural, Food, And Resource Economics. He worked as senior economist at the Michigan Senate Fiscal Agency in 2010 and returned to Michigan State University in 2011. He also worked at MSU from 2005 to 2010. Prior to working at MSU in 2005, Dr. Scorsone developed award-winning Extension programs as an assistant professor in the Department of Agricultural Economics at the University of Kentucky in the areas of rural health economics and economic development. He also served as an Economist for the Colorado Governor’s Office of State Planning and Budget and as a Senior Economist for the City of Aurora, Colorado. He received his Ph.D. from Colorado State University, where his dissertation focused on economic models of growth in the Denver housing and labor markets. He received his Master’s degree from Michigan State University and a B.B.A. from Loyola University of Chicago. He has also worked on international development projects in Thailand, Macedonia and Indonesia and has taught at the taught at the University of Bologna, Italy and University of Valencia, Spain in public performance management. He has published in State and Local Government Review, Growth and Change, Journal of Appalachian Studies, Economic Development Quarterly, Journal of Federal Studies, Public Money and Management, and International Review of Administrative Sciences. Dr. Scorsone is from Saginaw, Michigan and currently resides in DeWitt, Michigan.